After a goalless first half on a hot afternoon in Samara, the world's most expensive player tapped in from the impressive Willian's cross for his second goal of the tournament on 51 minutes. 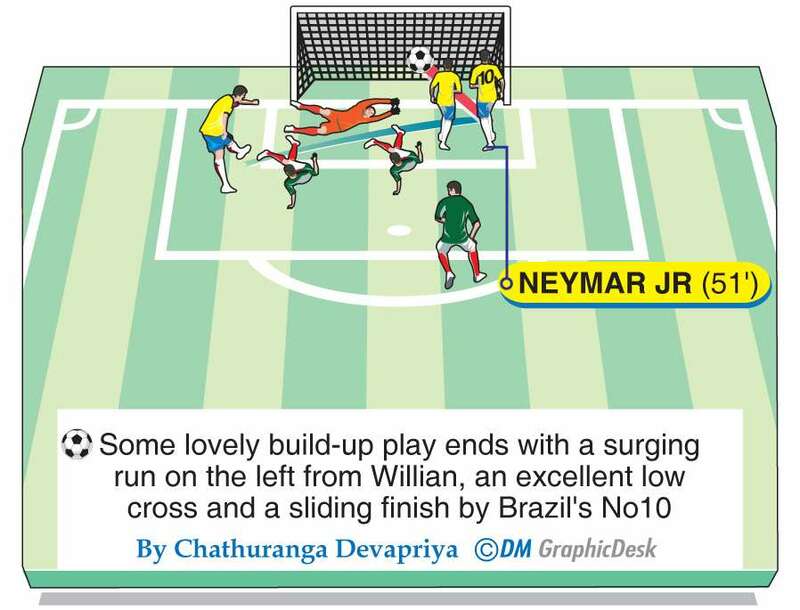 As Brazil pressed their advantage, Neymar set up Firmino for another close-range finish that sealed the victory. In between, he writhed in agony on the turf after a Mexican opponent appeared to stand on his ankle, but the referee ruled there had been no foul and Neymar was soon on his feet. Mexico threatened at times but their World Cup challenge was ended at the first knockout stage for the seventh consecutive tournament. Brazil will face the winners of the match later Monday between highly fancied Belgium and a Japan side dreaming of reaching the quarter-finals for the first time in their history after scraping through their group thanks to their fair-play record. Belgium are bristling with talent in the shape of Eden Hazard and Romelu Lukaku, but this World Cup has already shown that nothing can be taken for granted after a series of big names crashed out. Russian fans celebrated long into the night after they stunned 2010 winers Spain on penalties in an electric atmosphere at Moscow's Luzhniki Stadium on Sunday. The win sparked an outpouring of joy on the streets of the capital, with disbelieving locals cheering, waving flags, blowing horns and yelling “Russ-i-a!” Russia, ranked a lowly 70th in the world, will play Croatia in the last eight after similar drama in Nizhny Novgorod, where Luka Modric saw his spot-kick saved late in extra time before they held their nerve to defeat Denmark in the penalty shootout. “The KO in the last 16 is another dark chapter in our history,” said Spanish sports daily Marca, adding that it was “incredible naivety” to think Lopetegui's abrupt sacking would not affect the team. Roberto Martinez's dangerous Belgian side have lived up to their billing so far, winning all three group games. A host of key players including Hazard, Lukaku and Kevin De Bruyne will be fresh after being rested in the 1-0 victory against England. This is probably the best chance for Belgium's so-called golden generation to win a major trophy after they were eliminated in the last eight at the 2014 World Cup and Euro 2016. “This is our time to shine, definitely. We have top players and we play as a group, especially after the win over England,” Chelsea star Hazard said. “It's in our hands. We need to give everything and see what happens.” Japan reached this stage in controversial manner, by virtue of collecting fewer yellow cards in the group phase than Senegal. They have never won a knockout-round game at the competition. “Maybe Belgium feel the tournament is starting after their three wins, but I'd like to feel we are on a par with them. We have played to our best, but the players have something more to offer,” said Japan coach Akira Nishino.